This episode is sponsored by Quince & Co, where you will find 100% American wool yarn and responsibly grown plant fibers. Find them at www.quinceandco.com. 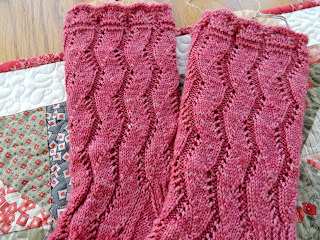 You can write to me on Ravelry where I am PrairiePiper or send an email to me at Paulaef@aol.com. 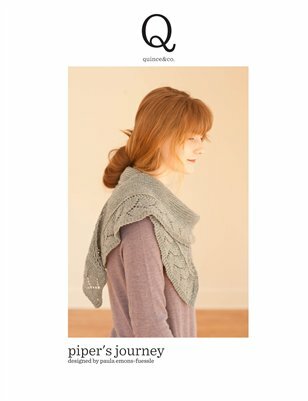 I’m on Instagram as Knittingpipeline, and on Pinterest as Paula Emons-Fuessle. Show notes are found at www.knittingpipeline.com. 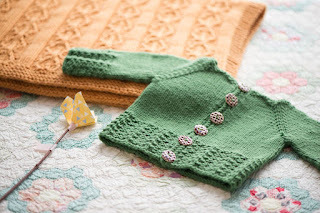 Join in the Knitting Pipeline Community by participating in our Knitting Pipeline Group on Ravelry and our Knitting Pipeline Retreats Group. Thank you to everyone who has been in touch with me and a special welcome to new Pipeliners who have introduced themselves in the welcome thread. Scrappingrn03 who is Jennifer in Phoenix, lajoyagirl who is Nancy in Deep South TX, SewknitC who is Naomi, born in Nova Scotia. New iTunes Review by Suburban Stitcher of Suburban Stitcher Podcast (video). Just wanted to drop you a note after listening to the episode about your Knit Circus socks. I am primarily a cuff down girl, but will resort to toe up in some cases. My biggest problem with toe ups is knowing where to start the heel. The best solution I’ve found to this problem is my foot template which I created when learning the Fish Lips Kiss Heel. Those templates are my favorite things. I have one for me and one for my son, my main sock recipient. I have marked on the cardboard where to start the Fish Lips Kiss Heel, but it’s also great for calculating where to start other toe up heels like Megan Williams’s OMG heel. Of course, row gauge is critical in this, but easy to calculate in order to compare start point to the pattern recommendation. These templates are similar to the sock rulers, but I like them even better because the width of the template matches our feet. If you have not yet taken the time to make one of the templates, I would suggest you get Bronwyn or Sarah to help do that the next time you get together and give it a try. Hope to see you in 2016! 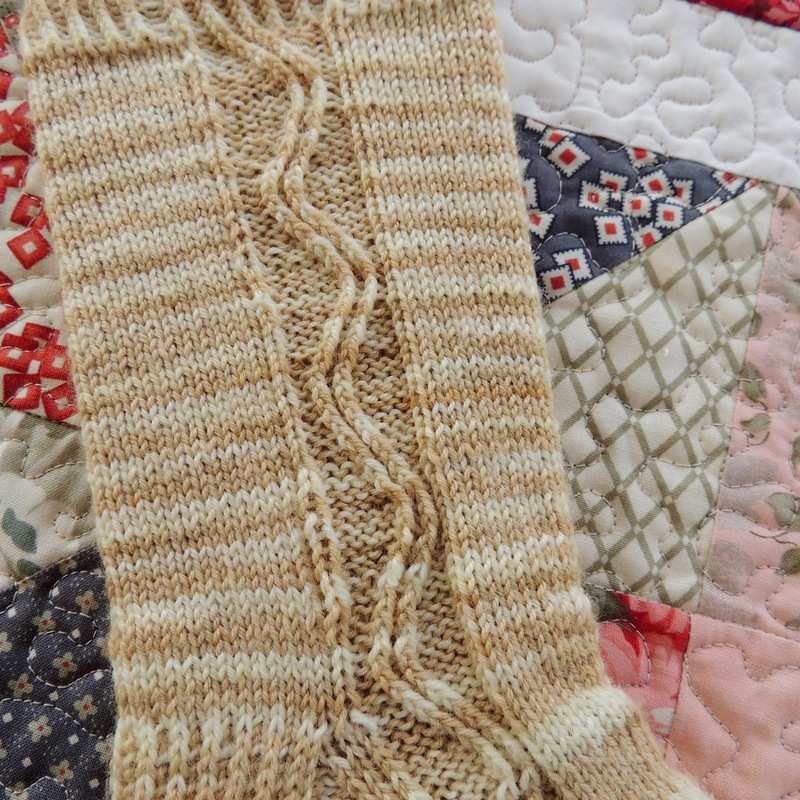 I knit my first pair of socks cuff down and was so paranoid about running out of yarn that I made the leg much shorter than I would have liked. Of course I had plenty left over, probably enough to knit a whole third sock, but decided that I would knit every pair after than from the toe up to avoid the worry of running out of yarn. Fifty or so pairs later, I’ve learned a lot about toe-up sock knitting. 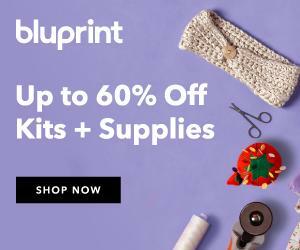 I’ve developed my own heel as well as figured out my favorite cast-on and toe shape, and how to convert cuff-down patterns. I would like to share all of this with you and also answer any questions you may have about toe-up sock knitting. Download Georgia Retreat Information and Registration Form HERE. Bob’s favorite sweater, worn neckline. Doubled yarn in front and for BO. Replaced heels in socks Gnome Acres. 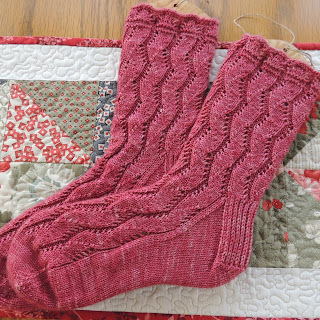 Afterthought heel socks so EASY to fix. 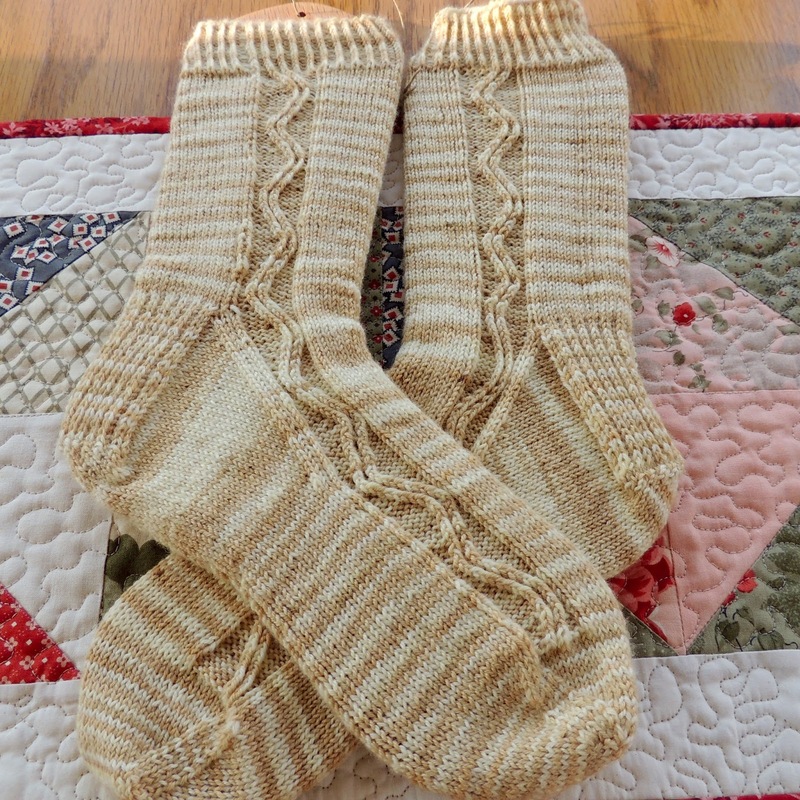 Two pair of socks both cuff down with traditional heel flap on size 0. 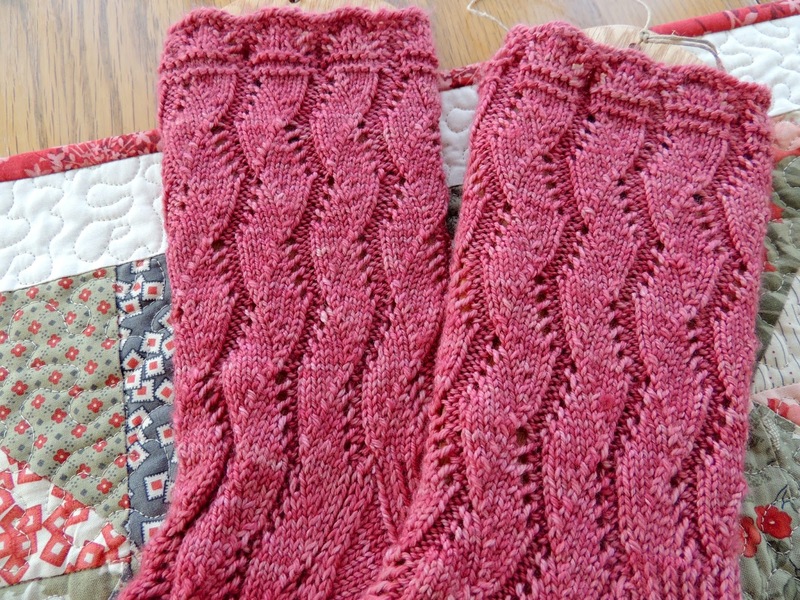 Knit mostly on dpn’s. Current favorite dpn’s are Knitter’s Pride Dreamz. Also like Knit Picks Harmony. Not as wild about Signature dpn’s or Karbonz at the moment. I hadn’t done a wedge toe in a while and forgot to eliminate the donkey ears on the first sock after grafting. I used Cat Bordhi’s solution that I talked about in Episode 67. It really works. Cascade Yarns Heritage Paints from The Fiber Universe March 2012. This is a fantastic pattern with a classic heel flap and wedge toe. 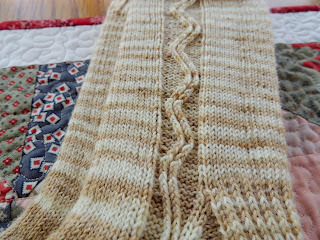 The traveling stitch pattern is easy to memorize and holds my interest. Once you get past the 1 x 1 twisted rib cuff you are zooming along especially if you can work the traveling stitches without a cable needle. This would be an excellent opportunity to learn to cable without a cable needle. Right cross and left cross are used throughout and knowing how to do this without a cable needle will really speed things up. 1. Look at where the stitches will be going and their relative positions. 2. Knit them in the order where they will be ending up. 7 pair men’s—oops! There were 8 pair. Missed one. Men’s socks are not that much bigger. Men’s size 12 (45 European) foot length is 11 ½ or 29 cm. From a Women’s Size 7 shoe to a Men’s Size 12, that’s only a difference of 2 ¼ inches in length—not really that much for knitters. Width might be another inch or so larger. So don’t be intimidated by socks for large feet as there really isn’t that much more knitting in them. The Goldfinch by Donna Tartt 2013 published. Pulitzer Prize for Fiction. Find Me Unafraid: Love, Loss, and Hope in an African Slum by Kennedy Odede and Jessica Posner (Five stars) Good book club discussion. The Girl Who Slept With God by Val Brelinski. 4 stars Coming of age in 70’s. Intriguing. Well written. Sweet and Sour Pie: a Wisconsin Boyhood by David Crehore. The Farmer’s Wife 1930’s Sampler Quilt: Inspiring Letters from Farm Women of the Great Depression and 99 Quilt Blocks That Honor Them by Laurie Aaron Hird. Comes with DVD. I really enjoyed the tips, thanks! I felt the same way about the Goldfinch. Actually I did listen to it on a roadtrip-it kept me driving!